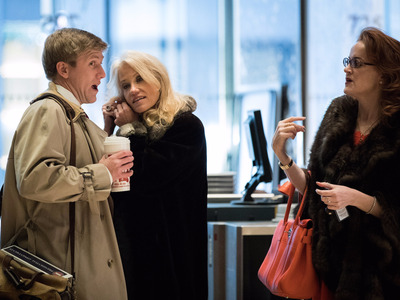 Drew Angerer/Getty ImagesNick Ayers, chief of staff to Mike Pence, and Trump adviser Kellyanne Conway with Rebekah Mercer (right) at Trump Tower in 2016. The power players behind Cambridge Analytica have set up a new company – and the daughters of Donald Trump-supporting billionaire Robert Mercer have just joined as directors. Rebekah and Jennifer Mercer joined Emerdata on March 16, but it is shrouded in mystery. Alexander Nix, the suspended CEO of Cambridge Analytica, is also a director, as well as other executives from parent firm SCL Group. Emerdata also lists Johnson Chun Shun Ko, a Chinese executive from Frontier Services Group, the military firm chaired by prominent Trump supporter Erik Prince. Cambridge Analytica is under scrutiny for the role it played in the US election after The Observer revealed the firm had illegitimately hoovered up Facebook user data. According to public filings at Britain’s Companies House, Emerdata was incorporated in August 2017 and the Mercers were appointed to its board on March 16 this year. Business InsiderThe Companies House filing. Cambridge Analytica’s now-suspended chief executive, Alexander Nix, is also listed as a director, as is Julian Wheatland, chairman of Cambridge Analytica parent firm SCL Group. The filings show Wheatland set up Emerdata along with Cambridge Analytica’s chief data officer, Alexander Tayler. Nix’s role in Emerdata is unclear given he has been suspended from Cambridge Analytica. A spokesman did not respond to a request for comment. Prince also donated to the Make America Number 1 PAC, a Mercer-funded group that supported Donald Trump’s presidential campaign. Make America Number 1 paid Cambridge Analytica$US1.5 million in 2015 and 2016. During undercover filming by Britain’s Channel 4 News, CA executives revealed how Make America Number 1 was used to seed online attack ads against Hillary Clinton. The appointments indicate the strong ties between the Mercer family and Cambridge Analytica. Robert Mercer is the primary funder for Cambridge Analytica, and was also a major backer of Donald Trump’s presidential campaign through the Make America Number 1 PAC. He’s also the major funder behind controversial right-wing news site Breitbart. Breitbart’s former executive chairman and former White House advisor, Steve Bannon, once sat on the board of Cambridge Analytica. Trump’s team once appointed Cambridge Analytica to run its digital campaign – something the firm boasted about in secret recordings taken by Channel 4. According to Politico, the Trump camp is now trying to distance itself from the company following revelations that it misused millions of Facebook users’ information, plus incriminating undercover recordings which show the executives boasting of their ability to manipulate elections and even blackmail political opponents. Nix was suspended from his role late on Tuesday after the recordings aired on Channel 4.